The Franklin Mint was founded in the mid-1960s to produce collectibles such as silver ingots, dolls, china plates and die-cast models. The Mint marketed their products as investments which the buyer could enjoy over time as the value of the object increased. But unfortunately, the values did not increase for all items and today, establishing a value for Franklin Mint items can be tricky. Limited Editions Were Not Necessarily "Limited"
The Franklin Mint was the brainchild of entrepreneur Joseph M. Segel who was one of the earliest entrepreneurs in collectibles. He set the tone for later companies to create a collecting niche and then fill it. The Franklin Mint was a private mint, not a Federal Government entity. The company advertised in many magazines for the general public, indicating that the objects for sale were being made in "limited" quantities, and that once the run was completed the molds would be destroyed, guaranteeing the buyer a collectible. The problem was that the production runs were not really limited at all, since thousands of plates or coins or dolls were made during each run. "Limited" was in the eye of the beholder (or the advertiser). Although the company still exists in name, the Franklin Mint's heyday of production is over, and the prices of most items sold by them over the years have dropped below original retail cost. Franklin Mint offered dozens of dolls to buyers, painted and dressed like celebrities, Gibson Girls, bride dolls and "Little Maids of the 13 Colonies." 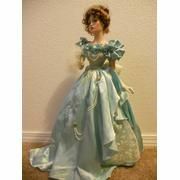 The dolls were made of bisque, and dressed in elegant clothing, with elaborate hairstyles, like Cinderella. 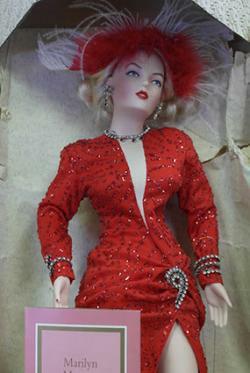 Other dolls focused on heroines of the silver screen, including Marilyn Monroe in "Gentlemen Prefer Blonds." Most Franklin Mint dolls were issued in the 19" - 22" size range. Their issue prices were usually around $200 but today, a doll with a certificate of authenticity but no original box may bring $50 or so on resale websites like Skyefaerie.net. One exception to this is the Jacqueline Kennedy bride doll, which can be found on collector sites like Lori Ferber Presidential Memorabilia, that still sells for about $200. Plates, ceramics, glass, and die-cast cars make up a significant portion of the collectibles sold by Franklin Mint. Franklin Mint collectible plates were decorated with all subjects, from the American Revolution to reproductions of Norman Rockwell paintings. The plates originally sold for $25 and up, while on today's market the plates bring $10 and under. Three-dimensional plates were also produced, such as a set of 12 that sold for $144 (sign in with a free account to see the final price). Ceramics included bisque (unglazed porcelain) statues of wildlife, birds and flowers. A search of online auction sites will bring up dozens of Franklin Mint statues selling for $100 and under, about half or less of their original price. For example, the "Vienna Waltz" sells for under $100. Glass included paperweights with sulphide portraits of American Presidents and French Kings. Recent listings in Kovel's Antiques and Collectibles valued an Abraham Lincoln paperweight at $60 and one of Louis XV at $15, far below the original selling prices. An exception to this would be the Pavlova wine glasses, which are potentially worth around $300 to $500 according to a WorthPoint expert. 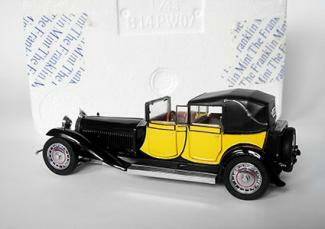 Die-cast cars were a popular offering from Franklin Mint but didn't tend to hold their value either. However, a recent article in the New York Times noted that many Chinese factories that make die-cast cars are closing. That may tighten the market and increase the value of the cars in coming years. 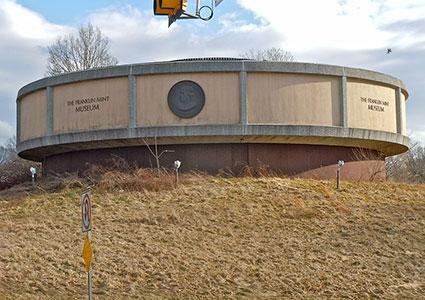 Of all the Franklin Mint items, the silver ingots, coins and medal collections are perhaps the most confusing when it comes to assigning a value to the items. 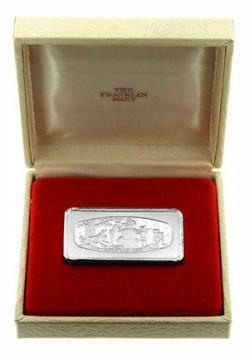 An ingot can be sold according to its metal's value, its value as a piece of art, or its value as part of a set. The website Franklin Mint Silver has detailed information on how weights are figured for the metal items, as well as cleaning and storage tips. Silver prices have fluctuated wildly over the past decade. A silver ingot may have been worth $100, then $60, then $300, and tomorrow, who knows? If you are purchasing a Franklin Mint set, you may want to ask the seller how he or she valued the set and why. Generally, a set of anything is worth more than a single item. With Franklin Mint, the set can drive up costs considerably: complete rare sets in display boxes with certificates of authenticity are often worth in the thousands of dollars. The value of coins, ingots, and similar items vary depending upon the condition. Scratches, missing display boxes, and wear marks will all reduce the esthetic value of a piece. It won't, however, reduce the value of the precious metal at all. Some Franklin Mint sets are difficult to fine, so all the original pieces in pristine condition in the original boxes can be hard to find for some sets. For example, the Christmas ingots are considered very rare, with 34 of them in the set selling selling for around $4000 or more. Remember, whatever the price you see listed on auction sites for a Franklin Mint piece - be it glass, ceramic or anything else -- is the asking price. It does not mean the piece will sell for that. When buying silver, check and see how the weight is calculated: a troy ounce is different from grains, or grams or anything else. Ask the buyer if you don't understand how he figured the value. Gold plate is so thin that the gold adds almost no additional value to a piece. Don't expect to get more than 40% of an item's value if you sell to a dealer. You can get free estimates online. Buying Franklin Mint items as investments has not proven to be a sure thing. Buy because you love the item and enjoy the memories it brings or the beauty it holds for you. That's the best bargain of all.